The French president, François Hollande, has reacted to the Nice attack by reiterating the war-like stance he took after the Islamic State attacks that killed 130 people in Paris in November. 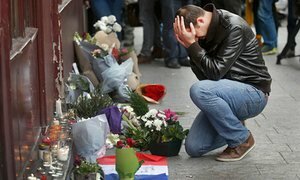 The motivation for Thursday’s attack has not yet been confirmed, but the fact that at least 80 people have been killed only eight months after the devastating November attacks on a Paris stadium, bars and a rock concert, constitutes a crisis for Hollande’s premiership. “All of France is under threat from Islamist terrorism,” said an ashen-faced Hollande in a televised address from the presidential palace just before 4am, hours after a driver ploughed a lorry at high speed into a crowd gathered on the Nice seafront to watch the Bastille Day fireworks. Marine Le Pen, leader of the far-right Front National, said France was only “in a war of words” in comments after the Nice attack. “Nothing has been done, absolutely nothing - no reintroduction of double punishment, nor depriving people of nationality, nor the closure of salafist mosques,” she told Le Figaro. The Socialist Hollande – who had already emphatically hardened his line on national security after the November attacks – announced he would increase border security and beef up existing home security measures already in place. The state of emergency introduced in November – which allows police to conduct house raids and searches without a warrant or judicial oversight, and gives extra powers to officials to place people under house arrest – will be extended by three months, Hollande announced. There will also be a boost to the military operation, known as Operation Sentinelle, in which 10,000 soldiers patrol streets and protect key sites across the country, and reservists will be drafted in to help security forces. But Hollande, who will hold emergency security talks at the Élysée this morning before flying to Nice, will now have to address the horror and pain of a nation that has been rocked by three major attacks in 18 months and several smaller-scale killings. A total of 147 people were killed in attacks in 2015 – from January’s gun attacks on the Charlie Hebdo offices and a kosher grocery store to the coordinated gun and bomb attacks on 13 November. Nice will add at least 80 deaths to this toll. The fact that many children were among the dead and seriously injured in Nice has deepened France’s sorrow and grief. The mood could not be more serious for Hollande. After the period of national mourning, there is likely to be intense political debate about intelligence and security policy. The 2017 French presidential election is nine months away and security was already a key voter concern. Hollande’s popularity rating has fallen to a record low. In contrast, Marine Le Pen, the far-right leader of the Front National, has been polling high and recent surveys show she is expected to reach the second round run-off of the presidential election, held in April and May, although the polls predicted she would not win. Sarkozy’s rightwing Les Républicains party is currently engaged in a primary race to choose its candidate. Early on Friday morning, authorities had not confirmed the exact motive for the Nice attack. In recent months France was already seen by its head of internal intelligence as the country most under threat from jihadi terrorism. The government said authorities had foiled attacks in the past year. The question of preventing attacks will now be a key part of the political debate of the coming months. The Nice attack came days after the end of the Euro 2016 football tournament, where a record 90,000 security staff had been deployed and which was celebrated for having passed peacefully. Hours before the Nice attack, Hollande – who appears keen to run for re-election but is not expected to announce his candidacy until the end of the year – had used his Bastille Day television interview to reiterate his new slogan that “things are getting better”. He had said in that interview that the state of emergency would not be renewed beyond 26 July, after the end of another sporting fixture, the cycling Tour de France. He was forced to revise that when the Nice attack occurred. The threat of terrorism and doubts about France’s handling of it have been swirling in recent days. Last week, a French parliamentary investigation into the 2015 attacks on Paris identified multiple failings by intelligence agencies. The parliamentary commission – set up to assess the failure to prevent a series of attacks last year – highlighted a “global failure” of French intelligence and recommended a total overhaul of the intelligence services, including the creation of a single, US-style national counter-terrorism agency. “Our country was not ready; now we must get ready,” Georges Fenech, head of the commission, said. France has six intelligence units answering variously to the interior, defence and economy ministries. Interior minister Cazeneuve had this week rejected the idea of a total overhaul of intelligence services. He said some of the report’s other recommendations were already being put in place. Also this week, a lawyer for victims of November’s attacks said the families planned to sue the French state for failing to avert the attacks carried out by assailants known to the security services. In a separate case, a court found the French state partly at fault over the killing of a French soldier in 2012 by Mohamed Merah, a militant whose activities had been tracked for some time by police and security services. Merah first killed three soldiers, without being stopped by police, before killing three children and a teacher outside a Jewish school in Toulouse days later. He was shot dead in a police siege at his flat.